This is a post I wrote over a year ago, not entirely sure why I didn't publish it but thought now is as good a time as any. The first society I joined on arriving in Christchurch was the university's whitewater kayaking club. Otherwise known as the University of Canterbury Canoe Club and fondly referred to as the UCCC (you triple see). At the beginning of every year the club runs an introduction to whitewater kayaking course. Back in '06 when I joined it was called "Combos", but has since been renamed to "Zero to Hero". Over the years the course has remained largely unchanged, comprising a pool session, a lake session, a surf session and then finally a river trip on the mighty north canterbury river the Hurunui. Having already done some paddling at high school in Te Anau I wondered whether or not to attend the course in my first year, not knowing anyone in the club I decided I might as well. I'm very glad I did because as soon as we touched the water I was made a "second" instead of a beginner. This meant assisting the more experienced club members to teach the basic paddling strokes. It was a good move as I immediately met the most active members of the club. Right from those early beginnings I loved the kayaking club. Throughout my first year I kept going paddling on all the easier trips, going to all the club parties in Christchurch, and having an amazing time in Murchison for "Whitewater week". Winter paddling isn't something I really tend to enjoy any more but at one stage I was proud to don the polypropylene and bright purple dish-washing gloves! More recently, in my last year in the club, I was being towed through deep snow to a river on our annual Hollyford Hoedown trip! You could be forgiven for thinking you’re doing something wrong when towing vehicles through deep snow to go kayaking! As an aside, I can’t believe just how awesome poogies are. I invested just before that particular mid-winter boating trip in Fiordland and have grown very attached to my new fake blubber. 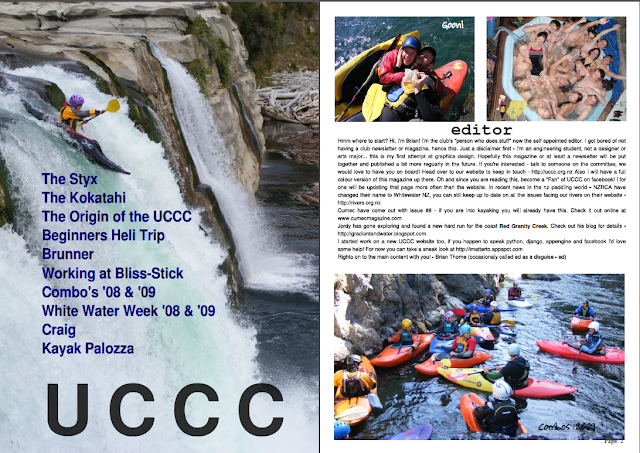 The UCCC has two very different facets; the social and the paddling. Some people are far more into one or the other! The club keeps pretty quiet about the Brunner pub crawl to the west coast, and I'm not terribly surprised - racking my brains I can't remember exactly what happened on the many occasions I went, although there is always drunken debauchery. From hot pools to fire-poi to the bus driver getting in on the action... anything goes. As my university years raced past I stayed intimately involved with the club. 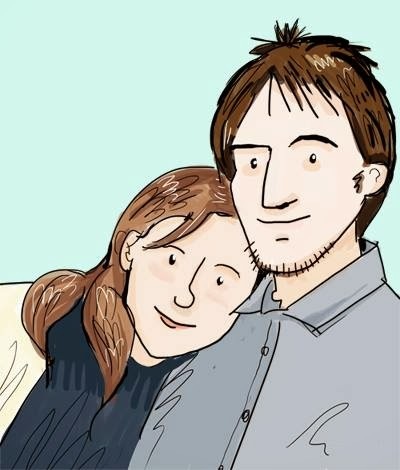 I took on a committee role, helping to write the club's website. Under the wing of El President Jono my kayaking and river skills kept improving, I found my personal sweet spot at about grade 4. After taking so much from the club I really wanted to give back. Although arguably the least qualified club member to do design work I decided we should have a club magazine. With plenty of help from wonderful friends I managed to edit together a somewhat respectable rag. Luckily others have done a much better job since then! The following years saw me take on various other roles until in 2009 I was made club president. The UCCC has an interesting policy where the presidential term is three years - theory was in order to keep some consistency and encourage older members to stick around. This has been good from my perspective, I can safely say most of the traditions have been passed on, and many new ones have started. Conservation is always a big concern for anyone who spends time in the outdoors and the UCCC is no exception. During my time the UCCC marched against creating dams for dairy farms, opposed destroying the Mokihinui for power generation among many other environmental and conservation causes. For the leaders and more experienced members of the club, there have been great opportunities to up skill by attending courses run by the New Zealand Kayak School in Murchison. The University of Canterbury Student Association has helped out the club with funding for new boats and equipment, for first aid courses and have even contributed funding for the leaders to be sent for river safety courses. One year I went up to Bliss Stick to promote relations with the club - ended up building myself a boat and purchasing six boats for the club. To sum up the club's influence on me over the last seven years? I guess it really all comes down to the people I've met. Right from that first exposure to the kayak club I've been impressed and blown away by the awesome people that are attracted to kayaking. I've paddled with world class paddlers like Anthony Longman, Willz Martin, Cooper Lambla and I've seen others rise through the ranks and are now taking on their own expeditions. Foremost is Jordy Searle, who joined the club at about the same time as me, and has gone on to become a great paddler. I've had the pleasure of watching others such as Ari Walker and Brian Urmson come right through the club, taking beginners out on trips as well as going on harder missions to the coast. These paddlers are now taking missions to places such as Papua New Guinea. But great paddlers aside, the real honour has been to meet so so so many really awesome people from all walks of life. I even met the wonderful Sarah at a kayak club event. Without hesitation my time with the UCCC has been spectacular. I'd recommend joining to anyone interested in Christchurch, even if you don't go to the University of Canterbury. Get amongst it. Make good stuff happen.